By way of illustration Alger translates for us an extraordinary series of love letters from 1792, between Mathieu-Guillaume-Thérèse Villenave, later the chronicler of the "132 Nantais", and his future wife Marianne Tasset. Do not fancy.....that I am a frivolous, fickle, thoughtless young man. .... For a long time I knew misfortune; I have felt the nothingness and frivolity of the world...I can say with Rousseau, "I do not know a better man than myself"
Receive the tender kiss of love. Remember that my fault is involuntary, that my intoxication is thine own work, and then — dare to punish me. He decided to keep his ecclesiastical dress and in 1783, through the influence of a family friend, the abbé Ricard, obtained a tutorship to the children of the comte de Pontgibaud. He had high hopes of making a literary name for himself; (in 1786 he competing for an Academy prize with an Ode in praise of the Duke of Brunswick). The duc de Richelieu subsequently entrusted him with the education of his nephews, the two sons of the duc de Piennes / Aumont at the château de Piennes / Courteilles near Verneuil. Villenave was from the first enraptured by the events of the Revolution. He threw off his clerical frock and "embraced with ardour of generous hearts, the great cause of the people" (p.5). on the very day of the famous Tennis Court sitting, he went about Versailles telling deputies whom he met where to assemble. At the end of 1789 founded a literary newspaper, the Rôdeur français but failed to make a success of journalism and he to resumed his teaching at the château de Courteilles. Villenave describes himself in the correspondance with modest complacency: "good-looking rather than not, and tall; there is nothing striking in his figure, but nothing displeasing. He has chestnut hair, dark eyes, good teeth; his countenance is mild and open, his manner is amiable and sensible." He was, comments Alger, a "true southerner...fervid and impulsive" - and already the the veteran of several amorous flings. 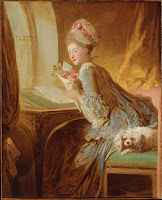 Before leaving home — whither he never returned, though his mother was living as late as 1797 — he had been in love with a novice in a convent; he had since had two other attachments, and he was now half engaged to a Mademoiselle Desroziers. Yes, you love me, I believe it, I feel it, and I begin to flatter myself that your inclination, springing from affinities of soul, will resist everything. Without ever having seen each other, and separated by over two hundred miles, the couple began an intense amatory correspondence. In three months,starting in early January 1792, sixteen letters were exchanged. All but the first were preserved and probably sold with Villenave's autographs and other manuscripts in 1845. They were published, without commentary, in the Revue Rétrospective for 1890 when they were owned by Frédérick Masson. 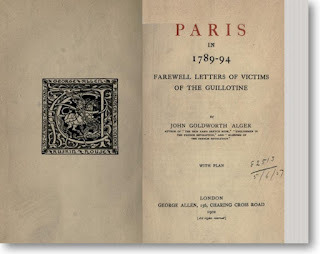 John Goldworth Alger supplies translations for some of the more telling passages: "After the lapse of a hundred years these love letters have not lost their aroma, but they are too bulky to give in full, and to summarise them would be like crushing a butterfly or a rose. Extracts must therefore suffice." (p.291). I have received M. de Villenave's letter. I should like, and I ought, to reply, but cannot. Apologise to him for me, dear Mélanie. Tell him that imperative circumstances do not allow me at this moment to give him a reply, which I shall soon have the pleasure of writing to him, that I could not do so just now in a way satisfactory to my delicacy, that I should be afraid of misleading him and deceiving myself, that I wish to be open and straightforward with him, as I desire him to be with me, and that if it is really true that my dear Mélanie's praises have kindled in his heart sentiments of which I am too little deserving to be able to believe in them, I shall endeavour, even while seeking to destroy them, to preserve his esteem. 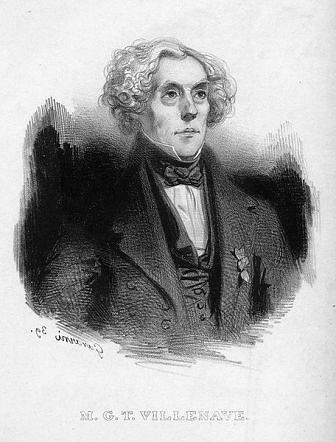 If M. de Villenave can reply satisfactorily to all these questions, if he can really succeed in persuading me of the fact of an attachment which I can scarcely comprehend, if finally I can succeed in reconciling my inclinations with my duties, I will then tell him all that my heart and circumstances may permit me to say. If you knew all that I have undergone since replying to M. de Villenave's letter, the cruel days, the sad nights, which I have passed, the fearful uncertainty in which I am placed, you would pity, oh! you would greatly pity me. . . . Mélanie, I confess that his letter surprised me to a degree I cannot express. You read it, you are consequently better able to judge than I, especially as you know the writer. Tell me candidly, do you think he loves me? So strange, so romantic, an attachment, is it natural? Do you not discern some motive which may induce him to feign what he perhaps does not feel? For how is it that, affectionate and susceptible as he seems to be, he has not rather profited by the happy chance which you offered to his view of becoming loved by an object combining, with the most pleasing talents and the most natural mind, all the seductions that the Graces and youth can add ? How is it natural, in short, that he has not tried to please an object present, and calculated to charm whoever has eyes and heart, rather than to be enamoured of a plain woman who is 200 miles off, and whom, perhaps, he would cease to love as soon as he saw her? Moreover, she remembers Mélanie having told her that Villenave had paid her attentions, and was also in love with " all your duchesses." “A fickle man, ready to take fire at the first object presenting itself, would not at all do for me. He would soon kill me with love and jealousy." What most alarms her are his good looks, for how can she satisfy him? How renounce the honest, estimable man to whom I am, as it were, pledged, and whom I may render unhappy? Ah! Mélanie, it would be much better for you to love M. de Villenave and marry him. Your children would be little darlings, I should be fond of both of you, and all four of us would be happy. . . . Pray write as soon as possible. For you must feel how essential it is for me to know what to expect respecting M. de Villenave. Do not, I entreat you, keep me in suspense. Try and sound him as much as possible. Remember that the happiness of my life is at stake. This preamble will perhaps surprise you, but allow me to tell you that the surprise will not be greater than I felt on reading your letter. I expected, indeed, to receive it; I even wished for it, but I was scarcely prepared for its contents. Do not imagine on that account that it offended me ; I am frank, and will confess that the avowal you make, so far from angering me, would have infinitely flattered me if I could have ventured to believe in it. But how can you expect me to believe and to persuade myself that you love me? Remember, sir, that you have never seen me, that you know me only by hearsay, that Mélanie's portrait of me was sketched by a hand which embellishes all it touches, and that that hand was guided by friendship. Learn, in short, that I may have some good points, but that altogether I am what is called a plain woman, that I am probably older than you, and reflect after all this whether, without running a risk of passing even in your own judgment for extravagant, I can persuade myself that I am capable of captivating a man of your merit, age, and figure. I believe you like me, but I think you form, from the praises lavished on me by a too partial friend, an idea of my mind and my slender talents which would be much lessened if I had the honour of being known to you. Disabuse yourself, therefore, sir ; do not take me for an extraordinary woman, but merely for an affectionate and extremely susceptible one, a woman whose heart does not always let her head reflect, a woman whose perhaps rather too lively imagination is ready to take fire, but never except for objects she thinks the worthiest of her esteem. You perhaps imagine me rich; now disabuse yourself of the idea. I possess something, and have expectations; my situation is tolerable, but in no way brilliant. However, I think I have already hinted to you that I am dependent on a father who will act generously to me, but will not impoverish himself for my benefit, especially as, while allowing me to marry, I am well aware he does not wish it. Before arranging anything, therefore, you must be sure of retaining your present post or of obtaining another which would make up for its loss. ... In testifying a desire to know you, I have no thought of urging you to come to Nantes ; I feel how ridiculous the proposal would be, yet I cannot conceal from myself that that plan, assuming it possible, is the only one which can make us acquainted, and can consequently decide my fate. So I am under the knife of destiny. At the moment I am writing my fate is perhaps settled, irrevocably decreed. Oh! Miss, you will not be mine, and I shall never see you. Fool that I was ! I contrived, despite all possibilities, to fancy that it would be possible to convert my heart's romance into history. . . . Oh! Miss, you escape me, I no longer hope for aught; I have read that letter, so fatal to my tranquillity; it is my admiration and my torment. All As over between you and me; I bid you a perhaps eternal farewell. . . . Your heart is pre-engaged. . . . Had I gone to see you, you would have said to yourself: "Behold him, he is neither handsome nor ugly, good-looking rather than not, and tall; there is nothing striking in his figure, but nothing displeasing. He has chestnut hair, dark eyes, good teeth; his countenance is mild and open, his manner is amiable and sensible; let us make him talk." Then I should have said to the amiable Miss, "My mind is better than my person. I know that you do not think yourself pretty, but if you love me you will ever be so in my eyes. I have not come 200 miles for your face or your fortune, but I would have come a thousand for your good and amiable qualities." Here, Miss, you would have blushed, but not so much as I should. "I come to offer you my hand and heart. I should have preferred to enrich you, I can only love you." He proceeds to quote four lines from Pope, beginning, "O happy state, when souls each other draw",which made Marianne imagine that he knew English, an idea which he had to correct. What was she (Mélanie) thinking of in telling you that she had made a conquest of me, and that I was in love with all the ladies of the chateau? Really, Miss, this puzzles me. Was it vanity, or merely one of those sallies made without reflection, and without foreseeing what may one day have vexatious consequences? I have great respect for our ladies, I find them amiable and kind, but assuredly that is all. Do not fancy, kind and amiable Miss, that I am a frivolous, fickle, thoughtless young man. I am 29 ; I have loved twice in my life. For a long time I knew misfortune; I have felt the nothingness and frivolity of the world; I have gained experience, tact, yet I have preserved my morals. ... I have numberless defects, but not one vice. . . . How flattered I feel to be able to call myself your ami. Your pretty hand has signed this permission. Oh believe, amiable Miss, that it is too much for my deserts, but not enough for my heart. . . . How alarmed I am at the inclination which draws you to my rival. What! you read him my letter, Mélanie's, and even your own. Oh, dearest Marianne, I am lost if you have not the courage to veil from him the secrets of your own heart and of mine. ... A word from your mouth and I fly to your feet, or I remain for ever fixed on the spot where destiny has prepared, matured, and decreed my misfortune. M. de Villenave's letter is charming; it proves what I knew but too well, that he is the most amiable, the most fascinating of men, but it does not at all prove that he is the man destined for me, for it was written before mine, and does not answer any of my questions. Ah! Mélanie, if he has received mine I am sure he has given me up. What man could stand such an ordeal? He would have to love, to love passionately, and how could he love me? He does not know me. She asks Mélanie to bring Villenave over to Nantes, and to make acquaintance with Blancard, who, if not an amiable, is a thoroughly honest man, to whom she has told all, as she was bound to do, for he has a chance elsewhere amply compensating him for the loss of her. I have seen everything, read everything, your letters, your post-script. I hold them, I clasp them, I read them, I re-read them, I cover them with tears and kisses; I am victor. Yes, yes, I enjoy my triumph. . . . They are mine, all your letters to Mademoiselle Mélanie. I hold them, I keep them, she shall never have them back, not even your first ones, though in these there is nothing about me. These are my titles, my glory, thy soul, thy virtues, thy mind, my happiness, my triumph. No human power shall ever deprive me of them. . . . Beg her to leave me this precious deposit, it is mine for ever; the thief will give it up only at the gallows. And Miss Tasset's portrait, painted by herself! more than a month ago it was stolen, taken by force. Oh ! that also shall never be restored. ... I also have made a sacrifice. A marriage that was offered me, a young lady, not handsome, yet pleasing, amiable, but not of much education, and without talent, not rich, but much richer than I am, a respectable family, to whom I was not displeasing. Well, six weeks ago I stated in the most straightforward way that I could no longer be reckoned upon. I had then but little hope of possessing Miss Tasset, but I was desiring, I was soliciting her hand; I would not leave an estimable family under any mistake. Behold, Miss, what delicacy prevented my telling you a fortnight ago, and what you should never have known had you refused me. . . . Thou wilt have to deduct much from thy friend's excessive praises, but I can say with Rousseau, "I do not know a better man than myself." Oh! Miss, kind and sweet friend, forgive me for having thou'd you : I swear that this shall not happen again without thy permission, but I shall obtain it, shall I not? . . . Receive the tender kiss of love. Remember that my fault is involuntary, that my intoxication is thine own work, and then — dare to punish me. I will not await your reply, my dear Marianne — allow me this sweet familiarity of expression — to ask you to forgive the extravagance of my last letter. . . . You will tell me "many sins are remitted you because you have loved much." Then, doubt not, I shall with difficulty resist the temptation of becoming still more culpable. I see myself 50 years hence a good old patriarch, with Marianne and our children, who will have learned to love each other and us. Adieu, good, amiable, sensible miss . . . Open thy sweet lips to the kiss of love. These kisses, which come from such a distance, are not bitter, like those which St. Preux received from Julia. Adieu, miss; adieu, Marianne ; adieu, wife. How sweet to talk with thee, how painful to quit thee. The first kiss. Illustration by Moreau le jeune for the first ed. of La Nouvelle Héloïse in 1761. You have seen my letters, you have read your own triumph and my weakness. I have only therefore to blush and be silent. But do not imagine it is with shame. Far from blushing at the feeling which draws me to you, I am proud of it, but I confess I would rather have kept you in ignorance of it till my worth could have taught it you. The confession, it seems to me, would have been sweeter for us. I should have read your happiness in your eyes; I should have said, " He is happy, and I am the cause of it." . . . You perhaps can wait patiently. You are a man, and a philosopher to boot, but I, who am only a woman, that is to say a weak, sensitive, curious woman, / wait? No, I can never wait above three weeks from to-day at most, and I shall conclude, if you do not come at the prescribed time, that you do not love me at all. . . . But alas, ought I to hurry you to start? Ought I to hasten the moment when I shall perhaps irrevocably lose you? For what if my presence lowers the veil which conceals all my imperfections from your eyes ? . . . I know not why, but of late I find myself much plainer than usual. Alas, it is perhaps because I never so much deserved to be handsome. . . . Fancy, not merely am I no beauty, but I am stout, tolerably well-shaped indeed, but not having what is called a slim figure ; I have a white skin, dark and rather full eyes, a countenance which people call expressive, and I had the finest hair possible, but an illness two years ago made me lose it. It is growing again, but is still short, and so thick that it enlarges rather than adorns my head. I have besides a large nose, thick lips, in short I am much like my portrait, but perhaps still plainer, and that, you know, is not handsome. ... I cannot love by halves; the lover who has learned to please me ceases to be a man, he becomes a god who rules and governs my destiny at his will; I live and breathe only through him. Remember that I shall love you as you have never, perhaps, been loved, but that I desire the like. Remember, lastly, that I have never understood fickleness, and that yours would kill me. . . . My mind has made, I am sure, more than a hundred journeys to Courteilles. Alas, if you would hasten your promised journey a little, you would spare me much travelling and fulfil all my heart's desires. ... I hope now to get at least one letter a week, but beware, sir, of writing me more than three; I should refuse them, and to make me take them in you would have to bring them yourself. How I long for, yet dread, the moment when I can clasp you both to my breast, bedew you with the sweet tears of sentiment, and say to myself, "Behold her who will make my happiness, behold him to whom I owe it." Ah, Mélanie, what it costs me to afflict an honest man, and what would I not give never to have known that unfortunate young man! I have informed my father of M. de Villenave's visit and sentiments. He seems disposed to receive him well, but I hear him sigh, though I hope M. de Villenave will convert his uneasiness into happiness, without which my own would not be perfect. On the 23rd February, Villenave writes to the abbé Bradt to ask him to break off negotiations in another quarter, for he had a more advantageous prospect, though still very uncertain. Nevertheless he would not run after two women at once, and would rather miss both than deceive either. It is difficult to reconcile this letter with what he had told Mélanie on the 12th February of a rupture then six weeks old. Had he three strings to his bow? My friend, I exist only the days when I hear from you, the rest of the week I pass in waiting and longing. I am constantly sending to the post, I ask everybody about the arrival of the mails, and I should exhaust the patience of those around me if their friend- ship for me did not make it inexhaustible. Yes, you love me, I believe it, I feel it, and I begin to flatter myself that your inclination, springing from affinities of soul, will resist everything, even our first interview, and that you will love me even without beauty, because you will love not my face, but my heart. If my letters fell into the hands of some prude I should doubtless be blamed, but as I have never been either a prude or a coquette, and as my feelings, I venture to say, are as pure as my heart, I do not blush to avow them to him whose happiness I hope they will ensure. . . . Ah, I begin to believe you are he whom my heart has so long sought, he who should realise all the dreams of my imagination, he whom I once thought I had found, but whom fate made me know only to deprive me of him for ever. ... If you come, as I presume, by coach, I will send somebody to meet you. We are sorry not to be able to lodge you, but except at night you will be always with us. 1 swear thou shalt be mine, mine for ever. No human power can prevent a union long doubtless foreseen and determined in the inexplicable Book of Fate. Thy father will love me, because I shall make his daughter happy. . . . Thou art an angel. No, thou canst not be plain Ah, thou shalt never be so in my eyes. ... I loved for six years a plain woman because she had answered my first letter without coquetry and with the effusion of a heart more enamoured than my own. Three days later he writes again to say that though he has done with correspondence, he will bring a number of letters to satisfy her father of his character. " I give thee the tender kiss of love." Oh how my heart thrills at the idea of soon seeing you. . . . Seeing you so handsome (in his "flattered" portrait by Mélanie, enclosed in the letter of the 27 th February), how is it possible not to find myself a hundred times plainer than usual? ... I was almost as vexed to find you as good-looking as to see myself (in the glass) so plain. . . . There is still time enough, make your reflections, spare yourself the horrors perhaps of repentance. You do not say whether you have a mother living, but I should be so glad to love and respect her. Alas that I have none. How her beautiful soul would rejoice at our happiness; how she would love you! But for three years she has rested in the tomb, and as long as I live she will be the object of my keenest regrets, just as while living she was that of my tenderest love. . . . The Nouvelle Heloise is for me the first of romances, Julia the first of women, and St. Preux the model of lovers. I know no hero in Richardson to compare with him. Clarissa, charming and interesting as she is, does not affect me, with her grand virtues, as much as Julia, tender Julia, even with her failings. . . . Should I not look for a room in the neighbourhood, as near us as possible? . . . Adieu, then, I leave you, but only to think of you, to look at your portrait, to read your letters, to applaud my choice, to bless her to whom I owe the happiness of again loving, in short, to busy myself only with you and with the moment when I shall enjoy the inexpressible happiness of seeing you, and hearing you ask me for the first time, " Dost thou love me? " — charming question, to which I shall eagerly reply, " How I love thee." Your letter is charming, adorable. You write like an angel, I should say like a god, but that it is dated Courteilles. That date pains me, and you know that the gods never give pain. My imagination still depicts your arrival with Mélanie. She enters first, I rush into her arms, but while embracing her, I look for you, I discover you at last, and I rush to clasp you too in turn to my heart throbbing with pleasure. My beloved, I am so full of this idea that frequently on hearing the bell, and seeing the door open, I involuntarily tremble and fancy it is you. She goes on to speak of an intimate friend who had ridiculed the notion of love without sight. She hopes Villenave is fond of music, and not fond of the chase. Oh, my beloved, in three days I shall be at thy feet, on thy neck, at thy side. ... I arrive pale, cramped, my hair untrimmed, dirty, crumpled, looking like a shop Adonis. I shall, however, if I can, spare my dear Mélanie the imposing view of my head buried in a large dirty cotton cap. Ah, if I had more vanity than love, I should not see Marianne till the day after my arrival, but even if I had just emerged from a bog I do not know whether I should be courageous enough to delay by one hour that first so ardently desired interview. Dining takes a long time, and we sleep at an inn every other night, so that though we set off this morning at 3, we have done only 40 miles. We shall reach Nantes on Sunday evening, perhaps at 6, perhaps at 10. . . . Twenty-four hours must still elapse before I see my beloved. Oh, how slowly the time passes. My impatience, my love, prevents me from sleeping. To depict my felicity would be to depict my gratitude, but I know of no colours, no pencils, which can express what I feel, no, not even yours. A happiness like mine is felt, it is not expressed. ... I write you this letter just before going to bed, for there is no writing when my dear Villenave is here, I can then only look at him, listen to him, talk with him, occupy myself with him. Remember that one generally marries but once in a lifetime, and that there is only one M. de Villenave in the world. He has travelled a hundred leagues for me, I feel that I would go a thousand for him. . . . One of the few men met with only in romances or in women's imaginations. . . . We are having delicious days together. No, never was there a mind more amiable, more tender, more sensitive, more loving, more loved, more worthy of being so. Never will be effaced from my recollection the moment when we saw and embraced each other for the first time. My heart could scarcely contain its feelings. I was no longer on earth, I was in heaven. I am still there, and can say that I know and taste happiness in all its purity. Villenave is seemingly capable of jealousy, for she now writes to Blancard asking him to drop the correspondence, and he, with renewed good wishes, regretfully consents. On the 22nd April she tells Mélanie that her father and her lover had had a few quarrels. The father evidently did not think a precarious tutorship a satisfactory position, and he wished Villenave to become a barrister at Nantes, but Villenave feels that it would be ungrateful to the Courteilles ladies abruptly to throw up his post. He is therefore to return to it, and Marianne is to join him in two months. The wedding has been delayed by Villenave having to send for documents. We marry, then, on Thursday or Saturday, at 8 p.m. I need not beg you to address supplications to heaven for your friend's happi- ness. ... I have but one thing to ask of heaven, the continuance of the love of him whom I shall not cease to adore except on ceasing to live, but who would soon make me cease to live by ceasing to love me. ... I send you a million kisses, as much for my dear Navau (a pet name she had given Villenave) as for myself. It is apparent that Villenave's notes (if they are indeed by his hand) gloss lightly over his true Revolutionary involvement. In fact from the beginning of 1793 he was an active member of the radical society Vincent-la-Montagne. In a harangue delivered before the Society in February 1793, on the occasion of a visit by three delegates of the Convention, he apostrophises the Republicans of Nantes as "proud without insolence, passionate without exaggeration, wise without moderatism”; since the city had not succombed to popular violence, the law was "the sole ministrator of popular vengeance" (p.7-8). In March 1793 he gave a public oration for the Montagnard martyr Lepeletier, in which he dwelled on Lepeletier's devotion to Rousseau, the "eloquent and sublime" Jean-Jacques. Evidently Villenave's liberalism was under some stress. At the time of the seige he was to argue that "law should slumber in such critical circumstances" and the situation was to be saved only by "revolutionary means"; legality should not be dispensed with but justice must be promptly enforced. ( Colombel, p.9). In June 1793 he was to rally resistance with such enthusiasm that he dropped his pistols in mid-speech. His enthusiasm did not prevent Mariannne being arrested as a foreigner and temporarily imprisoned in the château de Luzancey. Villenave himself was accused of federalism and arrested on 10th September 1793, so prior to the arrival of Carrier. After the triumphant acquital of the Nantais, he successfully defended Naux, Guillet and Chartier of the Revolutionary Committee. Following his return to Nantes, Villenave continued to practice as a barrister. He defended Charette, General Montbrun (charged with having surrendered Saint Domingue to the English) and "all the émigrés and priests that were sent for judgment". He soon professed himself disgusted by the ingratitude of his aristocratic clients; since they were left to pay what they chose, his receipts were scarcely a thousand crowns a year. When the bar was reorganised he did not trouble to qualify. His-father-in-law Tasset died in 1801, and two years later Villenave sold his library and decamped permanently to Paris, to a fifth floor in the house of the poet Delille; "I embraced with ardour the career of savant and man of letters". He supported himself by writing newspaper articles, compilations, contributions to the Biograpie Universelle and, in later years, became editor of La Quotidienne. He built up a new library of 25,000 volumes and, taking advantage of the chaotic Revolutionary market, pioneered the collection of autographs. His house became a resort of literary and political celebrities. Marianne, who suffered from cancer, died in 1832, but Villenave himself lived on until 1846. A glimpse of Villenave in old age is provided by Alexandre Dumas, who for a time had as his mistress Villenave's daughter, the writer Mélanie Waldor. In the summer of 1827, Dumas was prevailed upon by his friend Delanoue, to attend a public lecture given by Villenave at the Athénée and afterwards was invited back to tea at his home, 84 rue de Vaugirard. Although once the editor of a leading newspaper the eccentric Villenave now devoted his time to classifying and cataloguing his extensive collection of autograph letters, five rooms on the second storey of the house being given over to his treasures. Dumas soon won the old man round with gift of letters addressed to his father by Napoleon and some of the Marshals of the Empire.